Winter turned fierce in the opening weeks of 2009. 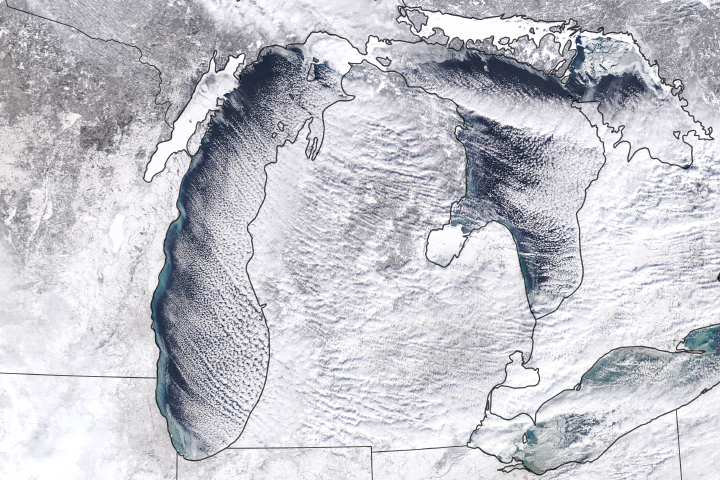 A bitter cold snap set in over much of the United States, and temperatures plummeted beyond -30 degrees Celsius (-22 F) in parts of the Upper Midwest. On February 2, portions of Western Europe were doused with heavy snow. England received the brunt of the storm with up to 20 centimeters (8 inches) of snow falling in London. It was the heaviest snowfall southeastern England had seen in nearly 20 years, reported BBC News. So why all the nasty weather? Part of the answer lies in the stratosphere, some 20 kilometers (12 miles) above the Earth’s surface. Starting in January and extending into early February 2009, wind and temperature patterns in the stratosphere changed dramatically. 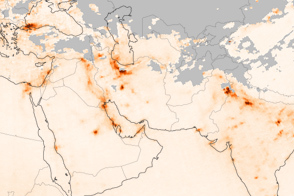 In just a few weeks, temperatures climbed by about 50 degrees Celsius (90 degrees F) on average, with larger spikes in places, and winds flipped direction, changing by nearly 100 meters per second (200 miles per hour). That change influenced weather patterns lower in the atmosphere. These images and the associated animation show how the stratosphere changed and help illustrate why the United States and Europe were in the grip of such odd weather. 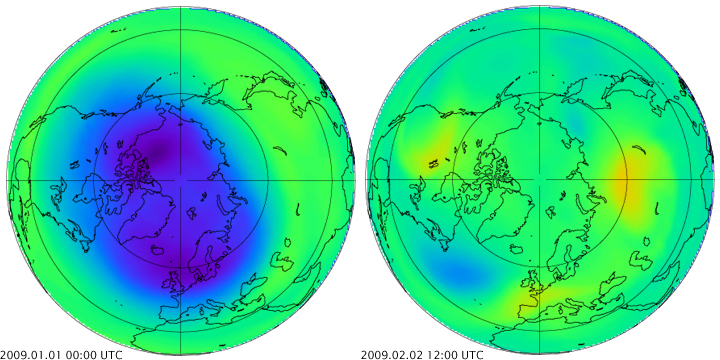 The globes show temperatures (top) and vorticity (bottom) on January 10 (left) and February 2 (right). (The animation runs from January 10-February 4.) The images are based on assimilated weather observations of the atmosphere from the Goddard Modeling and Assimilation Office at NASA Goddard Space Flight Center. In the winter, little to no sunlight reaches Earth’s northern extremes. Deprived of energy, the stratosphere over the Arctic grows cold. 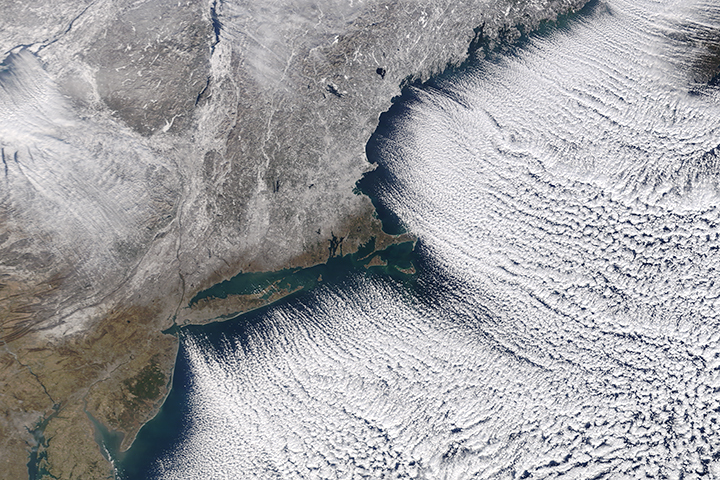 These were the conditions present on January 10, 2009, as shown in the top left image. The cold air mass creates a low-pressure system in the stratosphere that sits over the Arctic throughout the winter. Farther south, where the Sun is shining, the air is warmer and air pressure is higher in the stratosphere. Air flows away from the high-pressure system towards the low-pressure system. Because the Earth is turning, the air is deflected to the right as it moves north, creating a strong counterclockwise (west to east) current of wind, which scientists call the polar night jet. The lower pair of images represent the air mass, or polar vortex, that controls the wind pattern. Essentially, the winds are strongest at the edge of the polar vortex (where the pressure difference between the air masses is greatest). 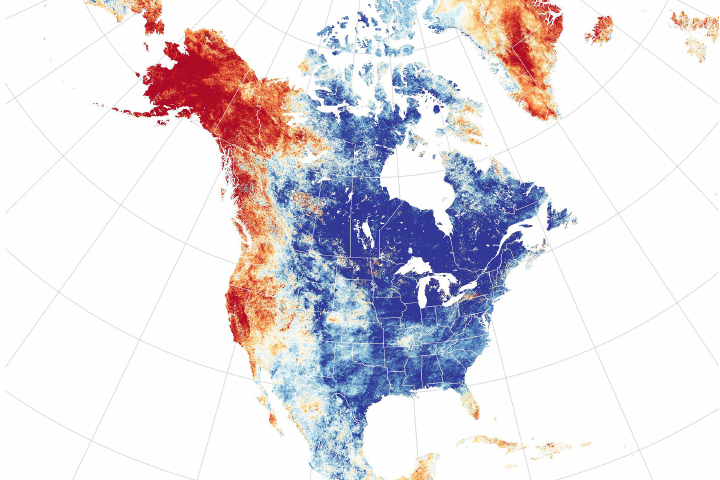 The area of red in the lower left image represents polar air that typically sits over the Arctic during January. In general, strong winds circle the red regions, or areas of high vorticity, in a counterclockwise direction. These winds, moving at speeds well above 100 miles per hour, influence winds and weather patterns closer to Earth’s surface. Their influence means that weather in England and Western Europe typically comes from the west. Over England, western winds blow in ocean air warmed by the Atlantic Gulf Stream. The big change in the Arctic came when the polar vortex ripped apart. A developing weather system in the lower atmosphere traveled upward into the stratosphere. The disturbance nudged into the center of the Arctic air mass, elongating it and eventually splitting it like a cell in mitosis. By February 2, two air masses existed, each with a jet of wind circling it counterclockwise as depicted in the lower right image. Warm air filled the gap between the two colder air masses, and temperatures high over the North Pole climbed, as shown in the upper right. Now the colder air had shifted farther south over Canada and Siberia. Over North America, this piece of the stratospheric polar vortex had a deep reach into the lower atmosphere (troposphere), which created strong winds from the north that carried cold Arctic air far south into the United States. In Europe, the split in the air mass actually changed the direction of winds in the lower atmosphere. 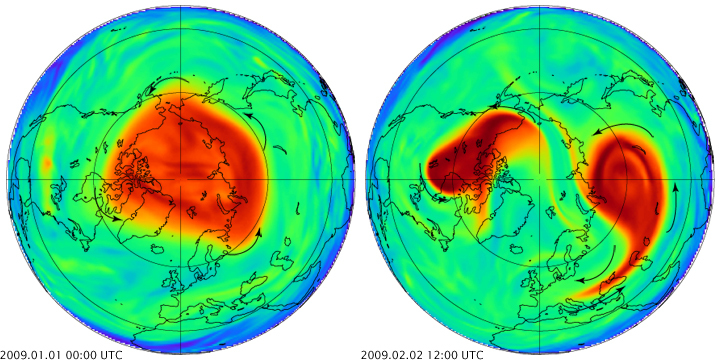 The second piece of the polar vortex was centered east of Western Europe, as shown in the lower left image, and it too was surrounded by a jet of strong wind moving counterclockwise. Like the segment of the polar vortex over North America, this piece of the polar vortex also had a deep reach into the lower atmosphere. It caused cold continental air to blow in from the east, replacing the warmer air that typically blows in from the west. As the frigid air moved over the North Sea, it picked up moisture, which fell over the United Kingdom and parts of France as heavy snow. Data provided by the Goddard Modeling and Assimilation Office, courtesy of Paul Newman. Caption by Holli Riebeek with information provided by Paul Newman. Winter turned fierce in the opening weeks of 2009, and part of the reason for the cold snaps and winter storms came from big changes in the atmosphere about 20 kilometers above the Earth.